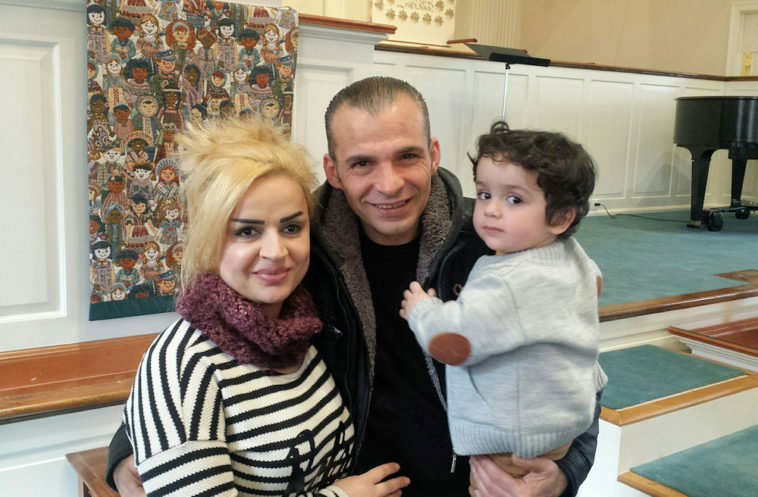 College Park is helping two Syrian refugee families that have landed in Greensboro. In addition to many household items and clothing that members are donating, our Syrian Refugee Fund will help with rent and other expenses to help them get established in a very strange place for them. DONATIONS: We are grateful for so many donations of time and household goods to get these two families established. Right now, money is the most useful since we can take the families shopping for what they want (including groceries) and pay for rent and utilities. Our Christmas Eve offering of $3,500 went to our Syrian Refugee Fund, and you can donate money online at any time or mail your check to our church office (1601 Walker Ave, Greensboro, NC 27403). A new, private Facebook group “CP Refugee Support” has been started and managed by Michael Usey. If you want to be added to this group for many more details, message him on Facebook. February 18, 2017: The new apartment for the first family of 7 is set up beautifully thanks to many hard working folks and generous donations of furnishings. A big group cleared out their home (where the toddler was mauled by the dogs) today so the family does not have to return. See the many news features from this week. February 14, 2017: Tragically, the 19-month old son of our first refugee family was mauled this morning by two pit bulls. He is in Brenner’s Hospital at Baptist in serious condition (in surgery for many hours today). Please pray for his recovery and his family that does not speak English. Meanwhile, we are setting up their new apartment so they can move. A GoFundMe campaign has been set up to raise money to help with this family. Also, we need volunteers to help set up their new apartment and move furniture and other donations from the church. February 5, 2017: Front page feature on the News & Record – read it online. — “God moment” Literally on our way to Target, we were informed of and given sizeable Target gift card by anon donor. This post would be even longer if we attempt to name the myriad folks who help. So many of YOU are doing cool thing(s). February 1, 2017 from Brooke Townsend: The Nazareth Bread Company on W Market is a wonderful place to take our new friends to. They have a small market of Middle Eastern foods and speak Arabic. I took Amani there today with her boys and we got a few groceries. The owner gave her extra bread and cookies for the boys. I hear many families use the space to gather as a community. Though transportation may be a challenge for our families to utilize this resource, it’s definitely something to let them know about. As we all know, building a sense of community is so vital to calling a place home. Local refugees receive a one-time “Reception and Placement Fund” between $900- $1100 per person, depending on the resettlement agency. Most resources go towards household set-up and must be used within 90 days. The Doris Henderson Newcomers School is for recently arriving immigrants and refugees students in grades 3-12, and is part of the Guilford County School System. January 27, 2017 from Stephanie Kretz: Our second family remains so very grateful for all! Jerry Elkins and Michael Usey delivered washer/dryer yesterday. Family selected clothing and housewares from the stash at church, thanks to Karlan Barker, who got us all there. Family and I shopped for groceries. Really long day, good day. Awesome translator was with us, briefly. Alice Stewart (fearless leader) and others keep us steering in right direction. Michael Usey reminds me our hospitality and friendship are every bit as important than the assets we provide. More so, even? We can spend time with family, showing them Greensboro’s great parks and receiving their hospitality. They are hungry to show it. January 19, 2017 Update: Our family has arrived safely. They started crying when they saw how beautiful the apartment was set up for them. The women’s parents have been here 8 months, and live in the same apt complex. We had a group about 30 to meet them. Her parents were there too, and their reunion made us all teary. The apartment is lovely–a huge thanks to all who donated time and things. Our family are excellent at languages; they already know three. Bus passes tomorrow and a trip to the supermarket. January 17, 2017 Update: Our second Syrian family is arriving this Thursday, Jan 19, 2:10 PM, United Airlines UA4842 from DC so you might want to keep a check on the arrival status. It would be nice to have people there with signs and balloons, and small gifts to welcome them. Only a couple people will take them to their apartment, so it’s just there at the PTI to greet them for a short while. January 15, 2017 Update: A group of us are going to set up the apartment for our new family on Wednesday, Jan 18, so any donations based on the previous list are welcome. This family has a baby and we will need a crib if anyone has one. The parent’s bed will be a double. If you are interested in working more closely with this family, we are constituting committees to help them out. The earlier family has already been here for awhile and have just fallen thru the cracks of the system. This new family are new arrivals and will need our help, friendship, and involvement for a few months while they get acclimated. Also, we will still help the first family to ease their transition into a new home (soon we hope). January 13, 2017: This Sunday night (Jan 15) at College Park, NC African Services Coalition will be leading us (and a couple other congregations) at 6:00 pm in Co-Sponsor Orientation in our chapel. December 22, 2016: Some great news! The father has been offered a job where another Syrian person has a job, so they can ride together. The family will be moving to a nicer apartment in Greensboro on January 15, so we can help them restart their home in an area that has other Syrian families. Can you imagine how nice it will be for the family to have people close by for support and encouragement, without having to use the Google translator app! And I’m sure the little boys will find some new friends. Except for some things like toys and clothes and the DVD entertainment, the family is currently covered for food and immediate necessities to get them through the week of the holiday season. However, we still have some needs to fill with the target being to help them set up their new apartment. Bring offerings (physical and/or financial) to the church. Since we don’t want to move things twice, the plan is to store things at church until moving day on Jan 15. I have done some research on what is needed to set up a refugee family and used that information to create a list for us to reflect on as we receive our many gifts from friends and family this next week. While I know we don’t want to create an unhealthy dependency, anything we can get them started with is something they do not have to use their scarce resources to provide for themselves. So please be thinking about the things on the list as possible offerings that we could provide by January 15. Anything offered should be dropped off at the church. Regarding duplication: We have ANOTHER family that is due to arrive on January 18. They will be starting from scratch, so we need to be thinking ahead. After family #2, we will take a breather to assess. December 22, 2016: Cindy, Alice Stewart, Charlie Wilson, Ann, the translator, and I went to the family’s home and met the mom and the two youngest boys. We had a good time. Alice and Ann were able to assess what they needed in the kitchen. The family is from Syria via refugee camps in Jordan. Cindy has lined up an apartment in an area in Greensboro where other Syrian families live. Ann & Alice took mom and the oldest boy to the Goodwill store and got a good table that seats six, and some clothes and boys’ shoes. Lisa Shortt and Alice then took them to Sam’s Club for food and essentials. Welcoming God means welcoming others in person.